In A Gathering of Ghosts, pilgrims visiting the holy well beneath the priory see the rock walls of the cave shimmering with gold. I’m sure that some readers will think that is a detail I simply invented, but this is a case where fact is as strange and amazing as fiction. For centuries, people on Dartmoor walking past caves, ancient stone huts or even old rabbit holes would glimpse something shining like gold inside. But, when they reached in to grab it, they found themselves clutching only a handful of wet dirt. What they had seen was a Schistostega osmundacea, a fragile, luminous moss known as Goblin’s Gold, or Elfin Gold. Only half an inch in height, the moss forms dense mats covering the walls of caves or holes where only dim light penetrates. It has special lens-like cells which focus the wavelengths of light it needs to photosynthesise, reflecting the rest back. 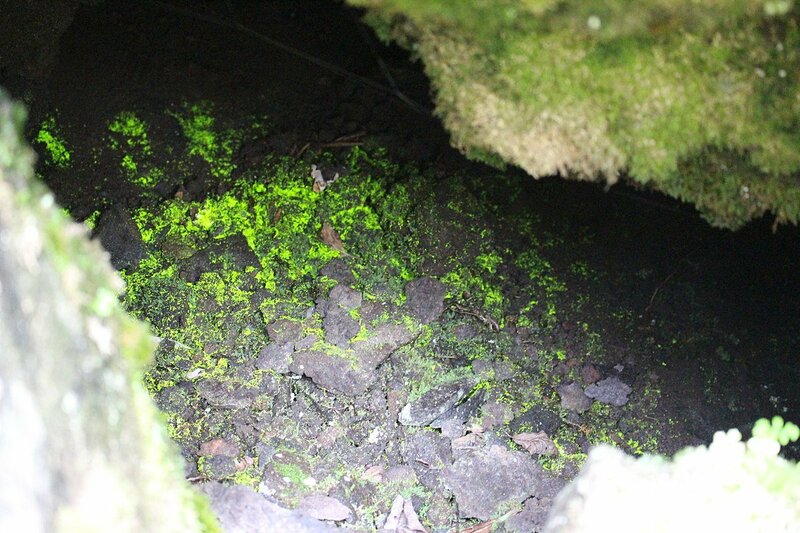 Seen against a dark background, the moss is a luminous green-gold and under flash photography can appear a vivid electric blue. Even today, though science can explain what is happening, the sight is magical. But imagine a medieval pilgrim creeping down into the darkness of a sacred cave with their flickering candle, and seeing the walls start to glow with gold which vanishes when they touch it… No wonder they called it ‘goblin gold’.